By Father Matthew Allman, C.Ss.R. Many of you may remember that I was stationed here St. Peter’s and the Neumann Shrine for four years, ending about three years ago. While I was stationed here, I did a lot of weddings. There are even a few couples that I married with us in the congregation this afternoon. It was one of the couples I was helping prepare for marriage a few years ago who introduced me to the “Five Love Languages.” Have you heard of them? They are an idea about how people act in relationships and the name of a popular book by Gary Chapman. Chapman theorizes that there are five basic languages in which we all communicate love. Out of those five, most of us have one or two that are more important to us, love languages in which we are more fluent. These are the love languages in which we most often try to express our love or in which we are most likely to understand or appreciate someone else expressing love for us. Chapman thinks it is important for people in relationships to understand how the love languages work so they can communicate to give love in ways others will understand and to receive it, even when it is not in the languages in which they are most fluent. Words of affirmation: telling people you love them, appreciate them, are grateful for them, and like being around them. Acts of service: doing somebody a favor, doing work around the house, running an errand for someone or watching the kids when that person needs to get out. Receiving gifts (and giving them): thinking of someone and buying an unexpected present in the middle of the day, managing to get that Christmas gift that is just perfect, knowing what to bring to the housewarming party. Quality time: just hanging out, showing up for the event, going wherever as long as it is a chance to be together. And physical touch: hugs for greetings, handholding in public, an unexpected arm around the shoulder, a kiss on the cheek. Just hearing those, do you know what your dominant love languages are? If you can’t name them immediately, you can take an online quiz tonight to help you figure it out. I took a quiz and the results weren’t too surprising. My dominant love language is “quality time.” I score next highest on “words of affirmation” and “acts of service,” and I am much lower on “receiving gifts” and finally, “physical touch.” The last one might not be surprising for a celibate man! I bring this up today because on the feast of the Epiphany, as we come to the end of Christmas season and celebrate a day that in many cultures involves the exchange of gifts, I’ve been thinking about gifts and gift giving. I’ve been puzzling over it a little. I told you, gift giving is not one of my dominant love languages. I am not strong when it comes to picking out the right present for my nieces and nephews or Mom and Dad. I don’t know if I did that well with it this Christmas, yet again. But quality time is at the top of my love languages. and I drove home to Maryland for Christmas Eve and Christmas day. Then I played New York City tour guide for family for a few days after that. I’m thinking that’s gift-giving too, right? That’s love in a different language. So I wonder about the gift-giving skills of the magi. Do you think the baby Jesus really needed gold, frankincense, and myrrh? These are lovely, symbolic gifts indicating Jesus’ royalty, his priesthood, and even preparation for the death he will undergo on our behalf. But still, I wonder if gift-giving really was the primary love language of the magi. I bet they spoke words of affirmation too. Lord knows they gave quality time so they could make the journey to be present. We don’t hear that they touched the baby, but we certainly hear that they embodied their loving reverence for him in the way they got down on the ground, prostrated themselves, and gave him homage. I also hope that while they were there visiting Jesus, Mary, and Joseph, they offered some sort of service for the family too. That would have been nice, right? Because presents are great, the gold, frankincense, and myrrh, but they are not everything and Jesus Christ, the Word made flesh, the son of God, our Savior and Emmanuel, God with us, He deserves everything. What do you give to God? What do you give to the one who has everything yet still has loved you into existence and who is so on fire for your good and your flourishing that He will enter into time and take on flesh to be with you, to walk with you, to speak words of love to you, to perform deeds of service for you, to touch you and heal you, to feed you, and to die for you so He can raise you up to glory to live with Him in love forever? What do you give in response to that? We ought to give back love in as many languages as we can learn. And we ought to give back everywhere that we can find God with us. That brings me to St. John Neumann, whom we’re remembering in a particular way this weekend for his feast. Here’s a man who learned languages out of love—English, French, German, Czech, Italian, Spanish, Gaelic, Latin, Greek, and Hebrew—all to know and serve and love God and God’s people better. In his youth and with his family in Bohemia, John first discovered the love of Christ for him and for the world, and John eventually got so caught up in the love of Christ that he was determined to live his life as a total response to that love. John would seek to make God’s will his will and to go wherever God called him, to serve however God needed him: to be the love that he received. It is kind of like in the first reading where the light of God shines on Jerusalem, and then in turn Jerusalem becomes a light to the nations. John determined to give himself in love to others because of the love he first received. And as John gave himself in love, he went in mission particularly to those whom Christ favored in the Gospel. Whenever possible, John chose to go to the abandoned, and the poor, the forgotten, and the outsiders. 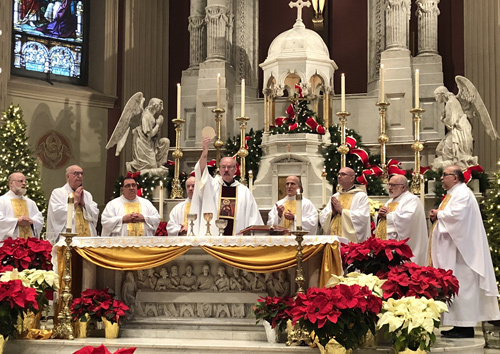 Even in his first assignment as a priest in the Buffalo area of upstate New York, when John was offered the parish church in town, he said no, he would take the missions. John would wander like the magi, finding Christ in obscure corners of the forest where holy families—and sometimes not so holy—were trying to make their homes. Rendering homage to Christ, John offered everything he had in service to God’s humble people. He gave his time, health, talents, wisdom, intelligence, and administrative abilities—and anything else he could think to offer. If you put it simply, he gave his life, as each one of us is called to do. Now obviously, not all of us are called to be a priest, a Redemptorist, or a bishop like St. John Neumann. But all of us, with our own set of gifts and talents and our own mix of personality and fluency in particular love languages, are called to give ourselves back to the one who has given us life in the first place. That’s what do here in the Eucharist and what we are supposed to be doing when we go back out these doors. We are drawn here to Mass, like the Magi to Bethlehem, to encounter the one who gives us everything we have and are. Here in the Eucharist, we join in the sacrifice of Christ to offer our whole selves in love to the Father in the Spirit. And as we experience the sacrifice of Christ, we are told to “do this in memory of [Him].” We are called to go out from here to love all the people whom He loves and to offer our lives in service of them, continuing the incarnation of God in the present, giving God flesh and bone in our lives so people will know God in our touch, our quality time, our words of affirmation, our acts of service, and our giving of gifts. So on this Epiphany, as we celebrate the Eucharist, may we come to shine with the light we receive from Christ, and like St. John Neumann, may we commit ourselves to speaking God’s love in a languages that everyone around us can understand. Amen.